Natividad is Pure, one of the rare girls born able to wield magic. Pure magic can protect humans against the supernatural evils they only half-acknowledge – the blood kin or the black dogs. In rare cases – like for Natividad’s father and older brother – Pure magic can help black dogs find the strength to control their dark powers. But before Natividad’s mother can finish teaching her magic their enemies find them. Their entire village in the remote hills of Mexico is slaughtered by black dogs. Their parents die protecting them. Natividad and her brothers must flee across a strange country to the only possible shelter: the infamous black dogs of Dimilioc, who have sworn to protect the Pure. In the snowy forests of Vermont they are discovered by Ezekiel Korte, despite his youth the strongest black dog at Dimilioc and the appointed pack executioner. Intrigued by Natividad he takes them to Dimilioc instead of killing them. Now they must pass the tests of the Dimilioc Master. Alejandro must prove he can learn loyalty and control even without his sister’s Pure magic. Natividad’s twin Miguel must prove that an ordinary human can be more than a burden to be protected. And even at Dimilioc a Pure girl like Natividad cannot remain unclaimed to cause fighting and distraction. If she is to stay she must choose a black dog mate. But, first, they must all survive the looming battle. Natividad and her brothers Miguel and Alejandro are on the run – and they’re hoping that their destination will offer a refuge. Hoping, but not counting on it. Natividad’s parents were killed in Mexico in an attack from their father’s enemy, and now they’re fleeing to his homeland Dimilioc, in Vermont. Dimilioc is their only option, despite its repulation. Natividad is Pure, a rare girl who can use magic, her twin Miguel is human, and Alejandro is a black dog, a shifter. And Dimilioc is famous for being the home of the most vicious and protective black dogs – black wolves – in North America. But before they can find a place in Dimilioc, they will have to prepare for a battle against the enemy that followed them across a continent. I REALLY liked this book. It had unique werewolf lore, diversity, fantastic world-building, beautiful writing, layered characters and an intense fight for survival (aka plot). Wait, I need to write more?! Ha. Let’s go with Natividad. She’s a girl who has recently lost her home as well as her mother, but she’s still intensely protective and caring. She’s not surrendering to anger or turning her emotions into reasons to fight. She doesn’t always know the answer, she sometimes acts rashly, but she’s constantly learning and hoping and surviving, driven all the time by love for family. I wonder if it is possible NOT to fall in love with Natividad. Even if Natividad didn’t carry the story, there’s Dimilioc and its complicated hierarchy, and Miguel and Alejandro struggling to find a place in it – all the while wondering if death is around the next corner. It’s pretty intense stuff, and that’s not even counting the fight against Malvern Vonhausel, their father’s old enemy. Add in the very nature of black dogs, where the ‘shadow’ of their other self is always trying to overtake their human side, and you have a setting rife with tension and anger, shame and secrets that keep trust from taking root. And still, that’s not all. Neumeier has written a story where familial relationships shine. Miguel and Alejandro and Natividad are the obvious family unit, but so too are the Dimilioc wolves. The give and take of those relationships adds layers of depth to every character – there are no cardboard representations in Black Dog. Also wonderful: the diversity of those characters and families, and the Spanish dialogue that Natividad and her brothers fall into unwittingly or use to describe their magic/nature. The obvious contrast of Mexico and Vermont adds to the strangeness of the situation for the newcomers. As Natividad assimilates to her new environment, so does the reader. It’s really rather genius. You may have noticed that I have said nothing yet about the fact that Natividad, due to her status as Pure, must choose a mate (it’s right there in the official summary). I understand that this is part of the culture/tradition in this setting, but it still made me uncomfortable in the extreme, especially at the beginning. I believe Neumeier deals with this element well (by narrowing the field almost immediately), but the fact remains that all of Natividad’s dealings with the Dimilioc wolves have at least a double meaning. Of course they value her magic, but they value her possible fertility even more. I can’t decide if I think this is creepy enough to be a true reservation, or adds to the world-building. Probably a little bit of both. I will certainly be reading the sequel, and I very much enjoyed the book overall. It’s young adult fantasy with a bite, and the tension and pace compliment the characterization and plot wonderfully well. Recommended for: fans of werewolves and unique paranormal lore, those who like diversity, great world-building and solid characters, and anyone who loved Robin McKinley’s Sunshine or Anne Bishop’s Written in Red. 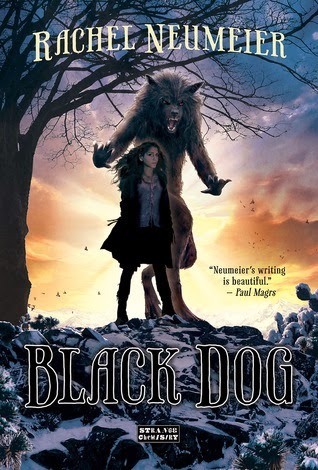 Fine print: I received an e-ARC of Black Dog from the publisher (Strange Chemistry) via NetGalley for honest review. I liked it lots too, even though I am not generally a werewolf fan! Hee, glad I tipped you over the edge. Yeah, the mate thing is just so difficult. I mean, it makes sense - Pure women are rare, they're the most likely to have black dog kids, Dimiloc wants black dog kids. I think I managed with it because Natividad seemed agreeable, but still seemed like she wasn't just going to let someone else choose for her. I dunno. It's complicated! But Neumeier meant for it to be complicated. Argh. Aww, I promised myself not to buy any new books next month but this one sounds too good not to... haha can't wait til reading it, you got me into a hype! I just finished this one, I noticed you mention a sequel. Is this part of a series? If so, how many books are planned for it? Gina: As far as I can tell, it's part of a duet/duology. Neumeier mentioned finishing book 2 on twitter the other day. If there are more planned, I don't know about them (yet! ).